Is this a classic British dish? Or a French or any European dish? Nay! I think this is simply a classic Gordon Ramsay dish. If you search the words, "sticky lemon chicken" in Google, all you can find are links at Life Style Food, Rachael Ray Show, Red online, You tube and Food.com and they are referring to the same dish... Gordon Ramsay's sticky lemon chicken! Gordon Ramsay!!! Love him or hate him... He is the famous Scottish celebrity chef, restaurateur, and television personality who gains most of our attention because of his extensive use of foul language on TV. Due to his "always-angry", "always-seeking-perfection", "always-alert" and "always-energetic" personality, Gordon Ramsay stands out for being an interesting TV host in many competitive cookery and food TV programs, such as the British Hell's Kitchen, The F Word and Ramsay's Kitchen Nightmares, and also the American Hell's Kitchen, Kitchen Nightmares, MasterChef, and Masterchef Junior. According to Wikipedia, Gordon Ramsay's restaurants have been awarded 15 Michelin stars in total and currently hold 14. His signature restaurant, Restaurant Gordon Ramsay in Chelsea, London has held 3 Michelin stars since 2001. Wow!!! Sadly, I don't have a chance to dine in these restaurants but at least, I can try cooking Gordon's recipes at home. Loving or hating Gordon? I'm very honest here saying that I like Gordon Ramsay because I really enjoy all the drama that he creates with his "angry" personality. I don't particularly love him but definitely not hating him. The curious me had asked my loving-cooking brother the same question too and he said that he likes Gordon Ramsay! He also mentioned that he likes Gordon Ramsay more than Jamie Oliver because he prefers Gordon's clean, quality-seeking, professional and precise approach of cooking rather than Jamie's homely, rustic and relaxed style of cooking. Gordon or Jamie? Oh! I must say this question can start a never-ending series of debate among some people... Personally, I think that the answer is up to each individual accordingly to our expectation. I like to be diplomatic here saying that I like both of them in their different ways. To start, I need to brown the chicken. ... and cook until the chicken is well-infused in flavours. 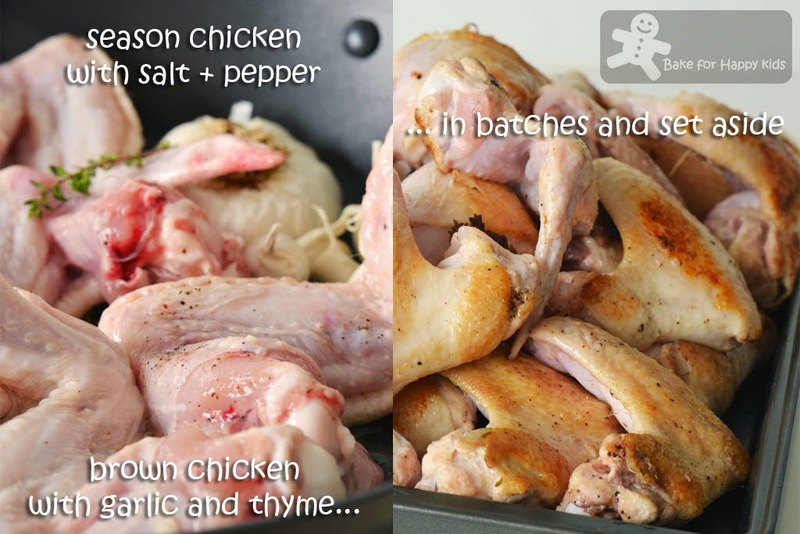 In this recipe, Gordon Ramsay recommends serving the chicken with champ. Champ? Accordingly to Wikipedia, it is Irish way of eating mashed potatoes with spring onion... and this is how I made mine. These are all I need. 1) Gordon Ramsay is also an agak agak man! LOL! Agak agak means estimation in Malay language. If you asks most mothers or cooks from Southeast Asian countries some details of cooking, they will tell you agak agak! I got lots of this sort of answers from my grandmother and aunties. In this recipe, Gordon didn't specify the amount of added vinegar and water. I guess the addition can be subjective to taste and preference. Hey Gordon! Nice agak agak! You might wish to know I can excel with good agak agak skill like yours too! - LOL! 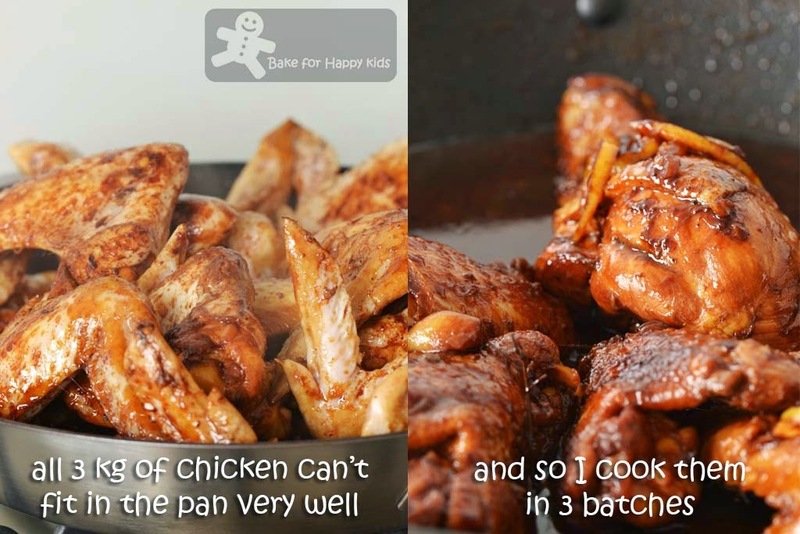 2) We prefer cooked chicken more without the skins! Boy: Mummy, these chicken are fatty!!! Man: Can you roast the chicken for crisper skin? Season the chicken with salt and pepper and heat the olive oil in a large sauté pan. Brown the chicken pieces (in batches if necessary) over a high heat with the garlic and thyme for 2–3 mins on each side until golden brown. 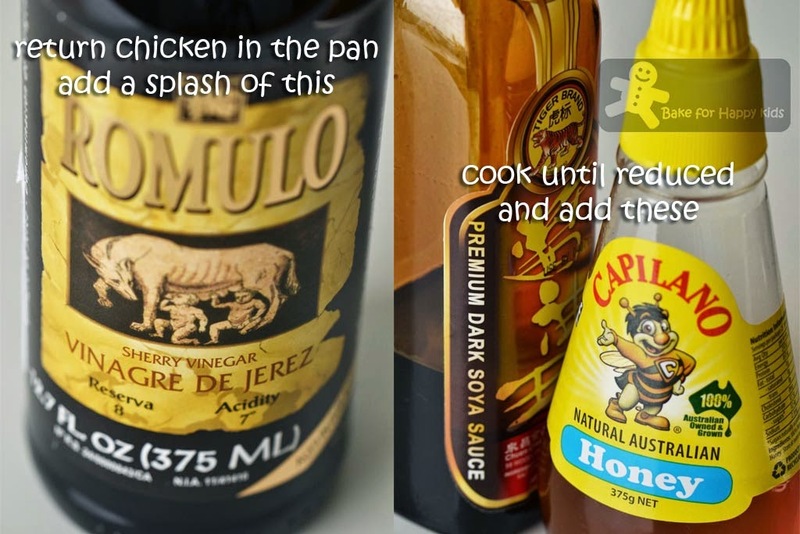 Return all the chicken to the pan, add the sherry vinegar and bubble until reduced by half. Drizzle over the soy sauce and honey and shake the pan to mix. 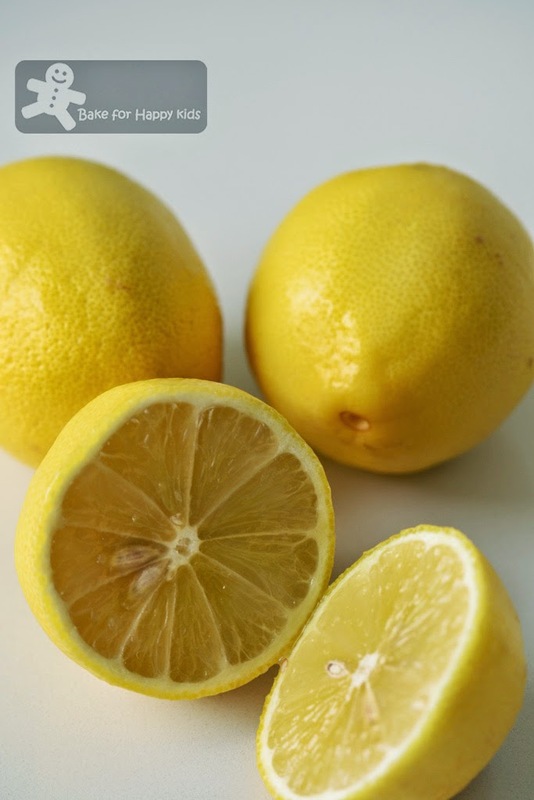 Pour in a good splash of hot water and add the lemon slices. Let the liquid bubble and reduce down until syrupy, which will take about 10 minutes or so. By now the chicken should be cooked through. Note: After adding the lemon slices, the chicken were cooked in 3 batches and each batches took me 15-20 mins. This amount that I cooked can serve up to 8-10. Due to our preference, the leftover chicken without the sauce were grilled at 180°C fan forced for 10 mins on each sides. Cut the potatoes into similar-sized chunks and boil in salted water for about 10 mins, until tender when pierced with a small sharp knife. Drain well. Mash the potatoes while still hot, using a potato ricer if you have one, then stir through the butter (I didn't add this) and spring onions. Pour the cream and milk into a saucepan and bring just to the boil. Take off the heat and gradually pour on to the potatoes, mixing well. If the mash is too thick, add a little extra milk. Season generously. Transfer the chicken to a platter and sprinkle over the chopped parsley (I forgot to add this), serve with the champ and green beans. Using half of the amount, I have made enough champ to serve 3 persons. When I see the title, I think of 'ling mung gai'.. Lemon chicken too but if I am to cook this, I will just buy a bottle of lemon sauce from the hypermarket, hehe.. Yeah lazy me.. And mashed potatoes, I will just boil them, mash with butter.. Maybe I should learn to cook like you, then my (picky) kid would eat.. Your chicken and mashed potatoes look so finger lickin' good!!! Good morning Zoe. 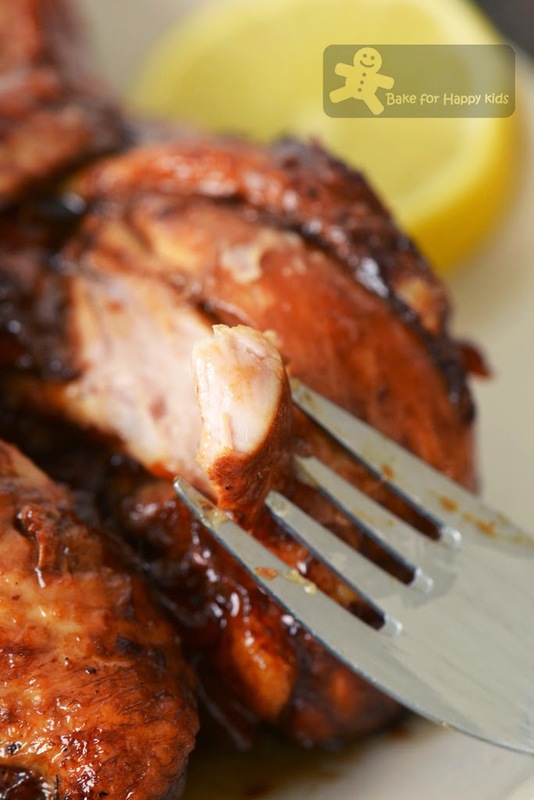 Your sticky lemon chicken looks so delicious and tempting. I am sure all habis already, no more leftover. I don't like to watch Gordon Ramsey's program's because they were overloaded with all the foul language, made it too stressful to watch. Not that I am a prude, but too excessive. Thanks for sharing GR's mouth-watering dish. Bet the chicken must be very flavourful and tasty.....last bite to finger licking!! Hi Zoe, coincidentally I've also bookmarked this recipe to try out in coming weekends. Hope my agak agak will turn out well. Yours really delicious ... yum yum ! Hi Zoe! 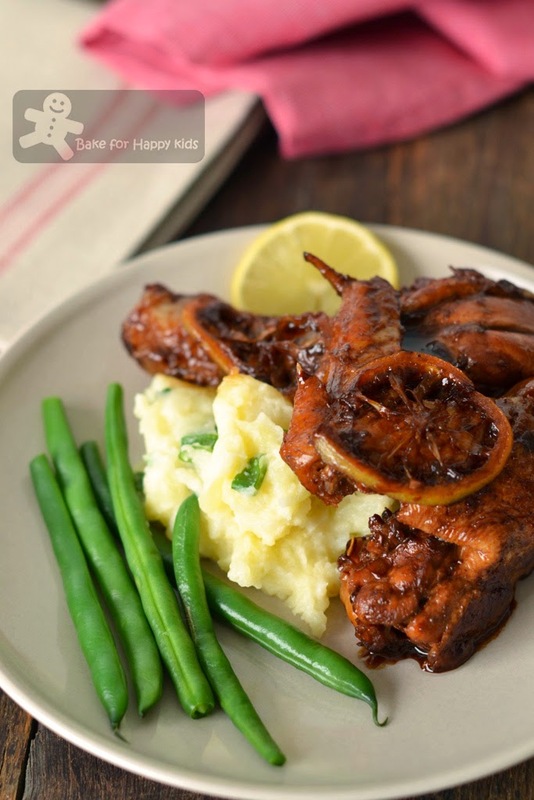 This sticky lemon chicken sounds and looks delicious! I have to admit being a fan of Gordon Ramsay. Foul language aside, I like his style and strong personality. Really enjoy his shows but have yet to try his recipes! Your pictures are making me crave for chicken wings! Looks gorgeously delicious! 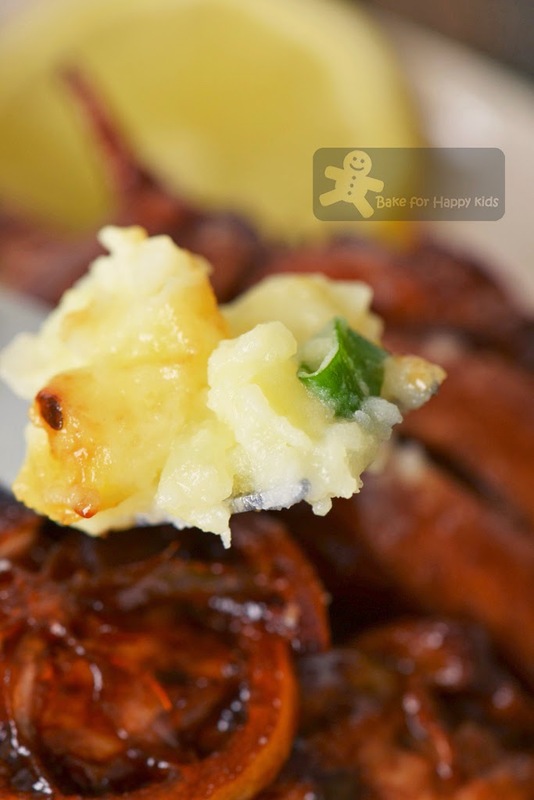 Hi Zoe, this chicken dish looks so yummy and served with potatoes, hmmm. yummy yummy. Such a delicious plate of chicken meal! You cooked 2 kg wings and 1kg drumsticks? That's a lot! Got anymore? I'll come over to help you finish them! Looks really yummy! I would probably lick my fingers after having such chicken :) sweet and sour sticky chicken! sounds so good! This looks so yummy that I won't even care whether it is British, French or European. Air mail some over please. *speechless!!! * oh my goodness, that looks super duper awesome! Great presentation too! Looks like a finger licking good recipe! This looks so yummy!! I'm a huge fan of honey marinated chicken! I love to brine my chicken with orange juice and then I'd make a citrus glaze to brush on during baking! Love your dish! This looks supper yummy and delicious! I'm not really a fan of Gordon Ramsey too. But this dish looks good.